Becoming a parent guarantees that you'll make mistakes. You'll say the wrong thing, make the wrong choice, and show up at the wrong time at least once in a while. You can also be assured there will be times when your child yells at you, laughs at you, and grows frustrated by you. All of those mistakes and reactions are par for the course. But your goal shouldn’t be to try and be a perfect parent—it’s simply not achievable. Besides, you don't need to be perfect to be an effective parent. Your mistakes, mishaps, and blunders are all opportunities to teach your child valuable life lessons. The most effective parents aim to raise a mentally strong, responsible child who will be equipped for the realities of adult life. Here are nine habits highly effective parents use to make that objective a reality. House rules and boundaries do more than keep you sane; they also help a developing child feel stable and secure. An effective parent is clear about what a child is and is not allowed to do, the chores that they’re expected to complete and how they should treat other people (and pets) in the home. Of course, every child missteps here and there. After you’ve given your child instructions, use an if…then warning. Say, “If you don’t put your toys away now, you won’t be allowed to go to the park.” This shows your child that while she’s allowed to make a mistake, she’s are responsible for their continued actions. If she violates a major rule—such as hitting you—follow through with an immediate consequence. Show her that your job is to help her learn to follow the rules, and consequences are meant to help her learn from her mistakes. There’s enforcing the rules, and then there’s being overly strict. You need to keep a little flexibility at hand for certain situations. Making too many rules is likely to backfire. A study done by the University of New Hampshire concluded that overly strict parents actually raise children who are more likely to break the rules. Additionally, research shows that children who have seriously strict parents often have lower self-esteem and a decreased sense of self-worth than those who have parents who loosen up every once in awhile. Your child should generally know the consequences for breaking certain rules, but effective discipline isn’t a black-and-white affair. Adjust the rules and the consequence as your family grows, children age and situations change. Effective parenting begins with effective communication. Even when children are just learning how to babble, they benefit from conversations with their parents. Chat about everything, from how his day was at school to how he feels about the upcoming baseball season to what he wants for his birthday this year. No topic should be off-limits. The longer the conversation, the more benefits it provides to your children. It teaches them about language, social skills and imaginative thinking. Regular conversations also help to make your child feel more secure and appreciated because it shows that you care about what they think. So talk to your child a lot when he’s young and he’ll be more likely to talk to you when he’s a teenager. This goes hand in hand with talking to your child more often. Reading aloud exposes your child to new vocabulary, teaches new concepts and allows him to immerse himself in new worlds. A child who is read to frequently will have a greater understanding of grammatical structures and a stronger imagination—not to mention a wealth of facts at their disposal if they prefer nonfiction books! Aim to read to your child individually for at least 20 minutes per day; a study done by the Organization for Economic Co-Operation and Development found that parents who read out loud with their children at a young age were up to a year ahead of their academic peers by age 15. Throughout your day-to-day life, you spend plenty of time with your child, right? After all, you go through the morning routine, you commute to school and work together, you eat dinner tonight, you tuck them in at night. However, none of this is true quality time, which a child needs with a parent in order to thrive. Aim to set aside 10 to 15 minutes each day to give your child your undivided attention to do an activity of his choice. Play a game, play dress up, or run around outside. Giving your child plenty of time-in will likely reduce the amount of time he’ll spend in time-out. Adversity builds character, but that doesn’t mean it’s easy to watch your child struggle. 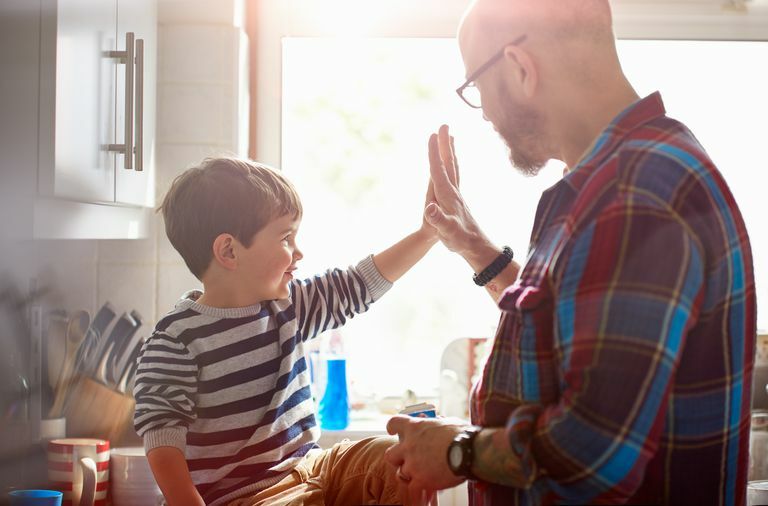 There will always be situations where your little one needs your help—or even a bailout of some sort—but as he gets older, take a step back to see how he conquers the challenges he faces on his own. If, for example, your child has been working hard to be named the pitcher on the Little League team and the coach selects someone else to be the starting pitcher, don’t swoop in and request the team leadership to rectify the situation. Explain to your child that sometimes, despite hard work, things don’t go the way you planned. Encourage him to continue to hone his skills and try again next year. This strategy not only teaches kids that their parents won’t always fix their problems, but also that sometimes things aren’t going to go their way—and that’s no reason to give up. Teach your child that he can deal with uncomfortable emotions, like failure and rejection, in a healthy manner. As early as 2 years old, a child is learning to make her own choices (and she’ll often be very vocal about them!) As she grows older, those choices are going to have more of an impact. While you don’t always have to agree with those choices, you should respect them (as long as it doesn’t jeopardize your child or another person in a significant way, naturally—use your judgment on that). Recognize that just because she doesn’t do things the way you might do them, doesn’t mean it’s a bad idea. If that choice doesn’t work out, then your child learns how the decisions she makes can come with consequences. If it does go in her favor, she’ll learn the positive impact that making smart decisions can have on her life. So, let your child face natural consequences once in a while. If she insists on going outside with a coat, and she isn’t in danger of freezing, let her do it. If she gets cold, she’ll be more likely to wear her jacket next time. You might feel like your children are your whole life and whole world—that’s natural. But that doesn’t mean you have to be with them 24 hours a day, 365 days a year. Parents need a break sometimes. Arrange some time away from your children for some self-care or to recharge your relationship. You (and your partner) get to make the decision about how much time you need and when you’ll need it; don’t let others tell you what’s appropriate and what’s unacceptable. It might be that your partner takes the children out of the house on Sunday mornings so you can sleep in, drink your coffee in peace and browse the internet to your leisure. Or perhaps you schedule a date night with a babysitter once a month, so the two of you can reconnect over an adult meal. Don’t forget to have a night away every once in awhile, too, by asking a grandparent, sibling or trusted friend to take your little ones overnight. It’s healthy to show your child that you have interests, hobbies, and activities outside of the house. And stepping away once in a while will teach her that she can be OK without you. Your love for your child shouldn’t have strings or limits, nor should your child feel like he needs to work for your affection. Highly effective parents make it clear that, no matter how many mistakes a child makes, they’ll always be there. They provide support, guidance and love as their child grows. And they watch that child become a happy, responsible adult—and that’s the overall goal of parenting. Don’t reserve praise for the times your child is perfect. Instead, praise his willingness to try hard or his desire to try again after he fails. Make sure your child knows that your love for him doesn’t depend on his achievement or success. Instead, show him that you love him no matter what. Wang, Cixin; Xia, Yan; Li, Wenzhen; Wilson, Stephan M.; Bush, Kevin; and Peterson, Gary, Parenting Behaviors, Adolescent Depressive Symptoms, and Problem Behavior: The Role of Self-Esteem and School Adjustment Difficulties Among Chinese Adolescents (2014). Faculty Publications, Department of Child, Youth, and Family Studies. Paper 94. Organisation for Economic Co-operation and Development 2013, PISA 2012 results in focus: what 15-year-olds know and what they can do with what they know, Programme for International Student Assessment, OECD, Paris.